All transactions are safe and secure with a reliable history in online purchasing behind each of our associates. 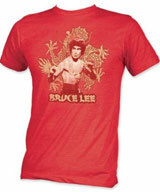 Buy the Bruce Lee Dragon t-shirt to own Bruce Lee clothing and merchandise. This attractive piece of Bruce Lee merchandise features Lee clenching his fists in his fighting stance. Behind Bruce is a gold dragon that matches his name, which appears under him. Whether you're about to Enter the Dragon or participate in a Game of Death, your homeboy Bruce has got your back. Order this Bruce Lee t-shirt with retro Bruce Lee hats, which are showcased in the gallery along with many other apparel items. In addition to the Bruce Lee Dragon tee above, browse the Bruce Lee Clothing Gallery for more apparel like men's and women's clothes, kids shirts or hoodies.